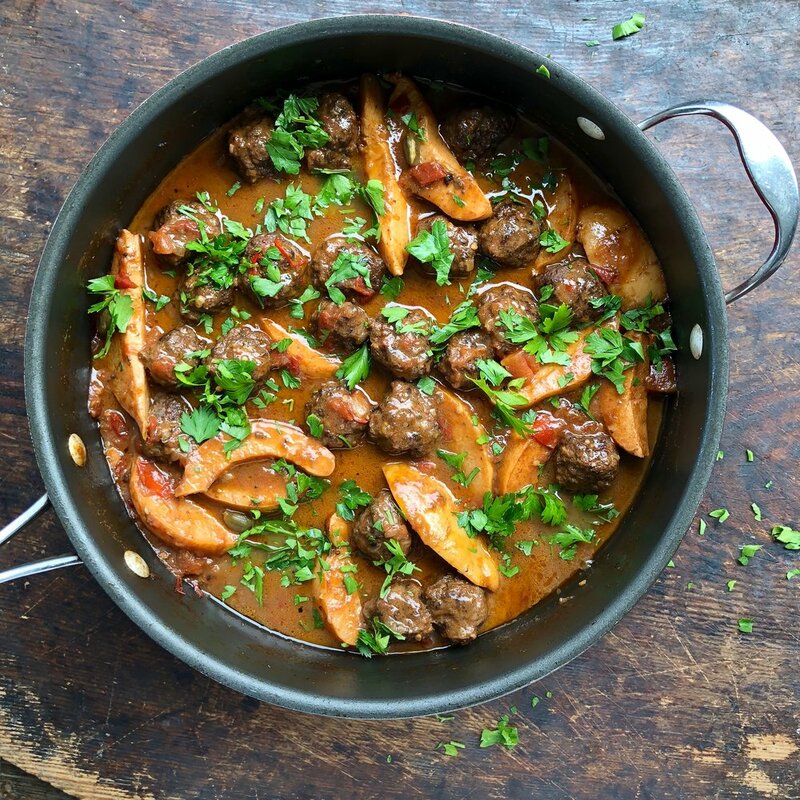 This is an interpretation of a Persian style dish that is an aromatic stew using beef or lamb with the spicy, tangy perfume of cinnamon and quince. Place beef mince, spices, salt and pepper. Using hands, blend until mixture is well combined. Roll into walnut size balls. Cut quince into quarters lengthways and remove core. Then cut each quarter in half. Heat oil in a large deep sided fry pan. Add meatballs and cook for 5 minutes, turning occasionally to brown all sides. Remove meatballs and set aside. Add the onions to the fry pan and cook for 5 minutes until softened and lightly golden. Add the tomatoes and chilli and cook a further 2 minutes. Stir in the cardamom and pomegranate molasses. Return meatballs to the pan. Add the quince pieces, stock and enough extra water to just cover all the ingredients. Bring to a simmer and reduce heat to low simmer. Cover with lid. Cook for an hour, the quince should be very soft and tender when pierced with a point of a knife. Remove lid and continue cooking to reduce liquid to thicken sauce. Serve warm with parsley or coriander leaves scattered over the top. Accompany with steamed potatoes, rice or cous cous.